Oregon Mountain Community, online at e-OMC.com, provides consumers with gear and apparel for a trip to the mountains or anywhere in the great outdoors. Products offered by OMC include backpacks, books, camera accessories, camping accessories, camp kitchen, climbing, clothing, dog products, food & nutrition, footwear, hydration, kid carriers, lighting, luggage, maps, sleeping bag/pads, snowsports, sunglasses, tents/shelters, and urban/ commute. There is no doubt that your purchase from OMC will be the highest quality, with brands featured such as The North Face, Arc’Teryx, Mountain Hardwear, Patagonia, Marmot, and lots more. For all the best Oregon Mountain Community deals, Oregon Mountain Community discounts, and Oregon Mountain Community codes, check RetailSteal.com first. OMC ships via UPS and USPS to the United States, Canada, and internationally. Free shipping is provided on orders of more than $50 to the United States. See website for other shipping rates and exclusions that may apply. Use our coupon code at e-OMC today to save 20% on all merchandise this summer. Don't miss out on the Screamin' deals at e-omc.com where you can save up to 50% on apparel, backpacks, sleep gear, and much, much more. Click link to shop. Sign up for your free membership at e-omc.com and enjoy a 10% discount on qualifying items. Get up to 35% off select North Face Jackets at e-OMC. Click link for savings. 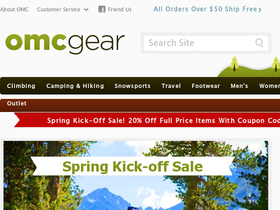 Save up to 58% on Mountain Hardwear Jackets online at e-OMC. Click link to buy. Save up to 50% on select items at e-OMC during the Winter Sale. Click link to save. At e-OMC, enjoy up to 30% savings on select Patagonia items. Click link to purchase.